However, I found the following piece in an old Air Forces Magazine (January 1944). Apart from being incredibly well written by a highly educated and unusual USAAF Corporal, it opens a window deep into that under-shared side of Eighth Air Force operations. There isn’t a lonelier spot in the world than a fighter field after the planes are gone. You sit there on your ammunition and wait. A squadron of Thunderbolts has roared over the channel to fly top cover for a flight of B-17s. There are fourteen men in those fighters. Thirteen of them are your friends. You have swapped addresses and hoisted beers with them. But the fourteenth is even more than a friend. 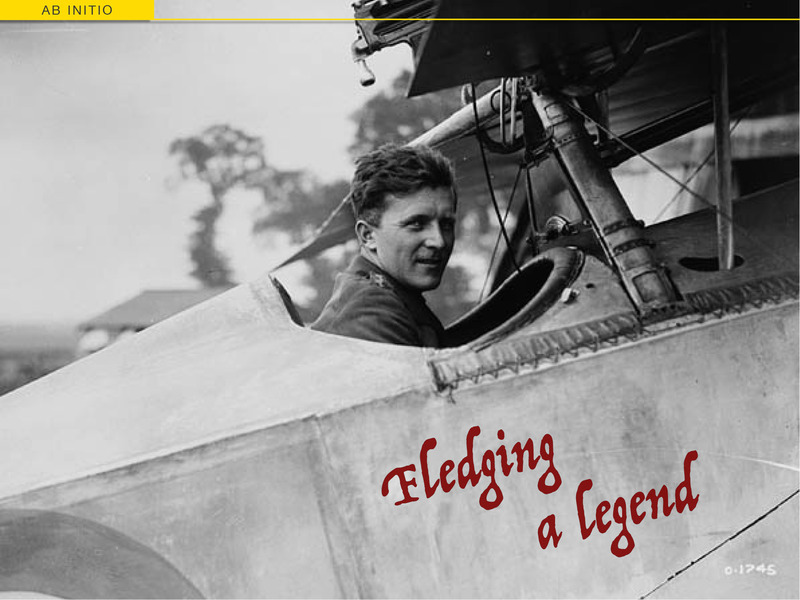 He is flying your plane. It is your plane, just as though the government had placed it personally in your hands. You have armed it and caressed it and cared for it and now you are sweating out your ship. As you sit there on a bleak, windy airfield, you feel lonely and apart form everything. You are shut off even from the few men in the nearby dispersal area who go about their business and try not to think about what is happening 25,000 feet over the target for today. But you do think about it. You think about the man in your ship. You are responsible for his life. It is your job to make sure that his guns don’t top firing when an enemy fighter comes blasting into the formation. You swear and pray and feel better for it. You wonder what our man is doing. And you hope he’ll be able to tell you about it himself. You are sure you sent him on his mission without any ammunition. You know you looked up that ejection shoot thirty times and saw the ammunition, but that could have been yesterday. You are positive that the breeching wasn’t exact. You are certain there was a split cartridge case. Then you realise you went over the ship with a mother’s care and it was perfect. But you worry. The wind sweeps across the lowlands and bites into your sheepskin coat. There’s a heavy ground fog and the sun is hidden behind an overcast. You have never been so lonely in all your life. Then the strange stillness is shattered by an RAF pilot on a bicycle who yells ‘Naafi-oop’. That means tea and doughnuts at the mobile canteen. ‘Naafi’ is British for Navy-Army-Air Force Institute, which is like our USO. You walk over for tea. Sometimes you get good old American coffee. After a while you wander into the radio room and listen to the pilots in your squadron talking to each other. They are only about sixty miles away over the French coast and you can hear everything they say. Most of the time you don’t know who is talking, but when a voice says, ‘They’ve got me. I’m going into the water’, you stretch and strain and try to recognise the inflections and the tone. Then you sit back. It isn’t your man. 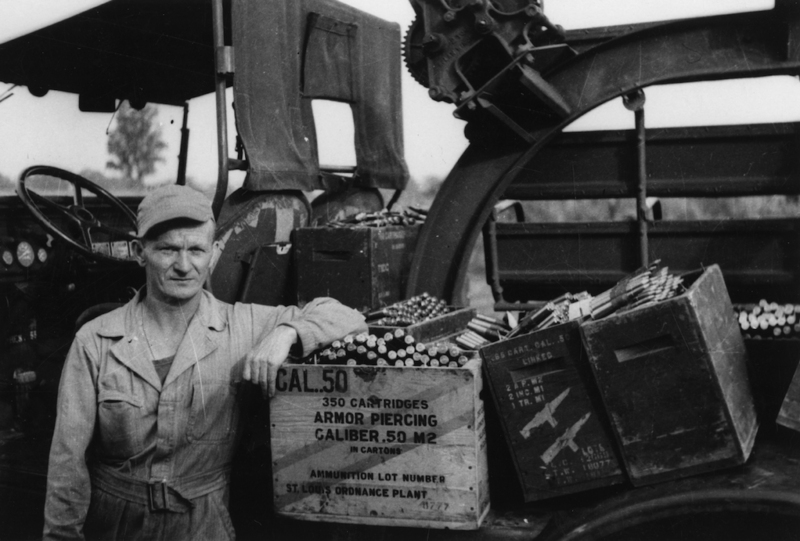 An Armourer stands up and asks for a cigarette. He offers an excuse and walks out. It was his ship. You know how he feels. ‘They’ve got me’ means death. And it hits you hard. You expect it and live with it and see it many times. But still it hits you. You watch the poker game. The players are ground men like yourself, and they are playing poker with one eye on a pair of aces and one eye on the sky. The first thing you learn as a ground man in a combat zone is how to count. When your squadron comes home you learn to count them while they are still barely visible. You look for holes in the formation, the obvious sign that somebody is missing. 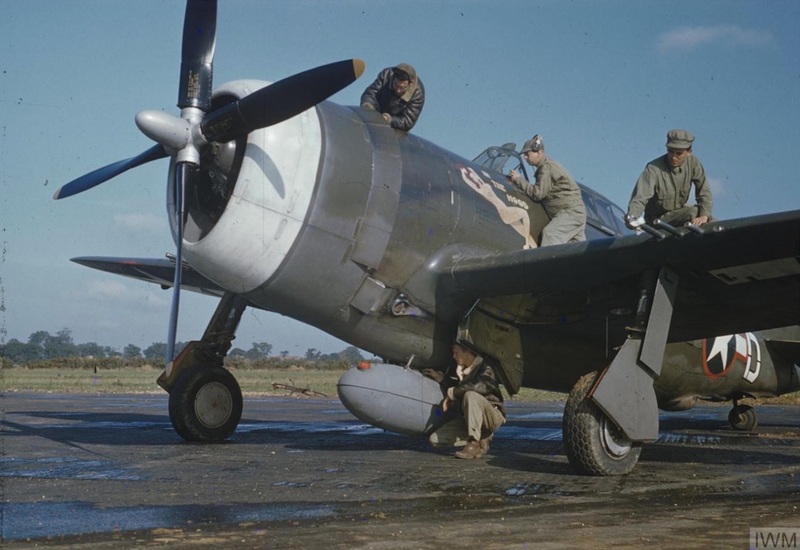 Identification experts will tell you that all P-47s look alike. But you feel you can pick out your ship while the formation is still miles away. Then you start listening. You can always tell if there’s been a battle by the listening to the whistle of the ind in the cannon blast tubes. If they have met the enemy the patch over the gun ports has been shot away, and that eerie whistle always causes a cold sweat no matter how many times you’ve heard it. When the ships come in you get ready to rearm them, for most of the time they’ll go right out again. You stand on the edge of the runway and as soon as their wheels touch, you start running. You look for your ship and your man. Sometimes he doesn’t come back and you go over and help another armourer. But your heart isn’t in it. You walk into the radio room again to see if your man has landed at an advanced airdrome. There’s always a chance and you play that chance right into the ground. Maybe he’s in the channel and the air-sea rescue outfits have hime. You don’t show your feelings. No one does. When it’s all over, you casually walk up to a returned pilot and ask him what happened. Very often a lost man will turn up a couple of days later. He’ll just walk in as if he had been in the barracks all the time. You never show your enthusiasm. It would be out of place. You merely look up and say, ‘Glad to have you back.’ Then sometimes you walk across the field where nobody can see you and cry. You blubber, and you aren’t too ashamed. Then you go about your business as if nothing had happened. The relationship between a pilot and his armourer is unlike anything you know in the States. There is no such thing as an officer and enlisted man. You go into London and tour the pubs with him, you share a bed with him. You don’t remember the last time you called him Lieutenant. There is no truck with rank. I’ve seen a lot of combat and I’ve known a great many men who didn’t come back. But the worst thing that ever happened to me was when my plane – my man – was shot down in combat. The Germans got him with an old trick. He followed the Jerry down and another one dove on him. He didn’t come back. Somebody asked me what happened and I gave the expected answer. 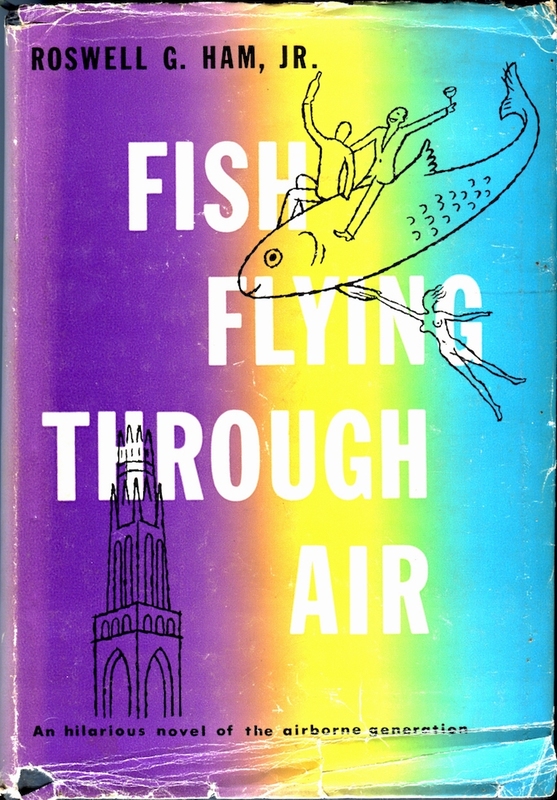 The cover of Fish Flying Through Air, Roswell G Ham, Jr’s second novel (Putnam Books, 1957). Roswell Gray Ham, Jr. had a refined upbringing. He was the eldest son of noted educator Roswell G Ham, who became the first ever male president of Mount Holyoke College, CT in 1937. Ham, Jr was born in Oakland after his father had spent served in the US Navy during WW1. 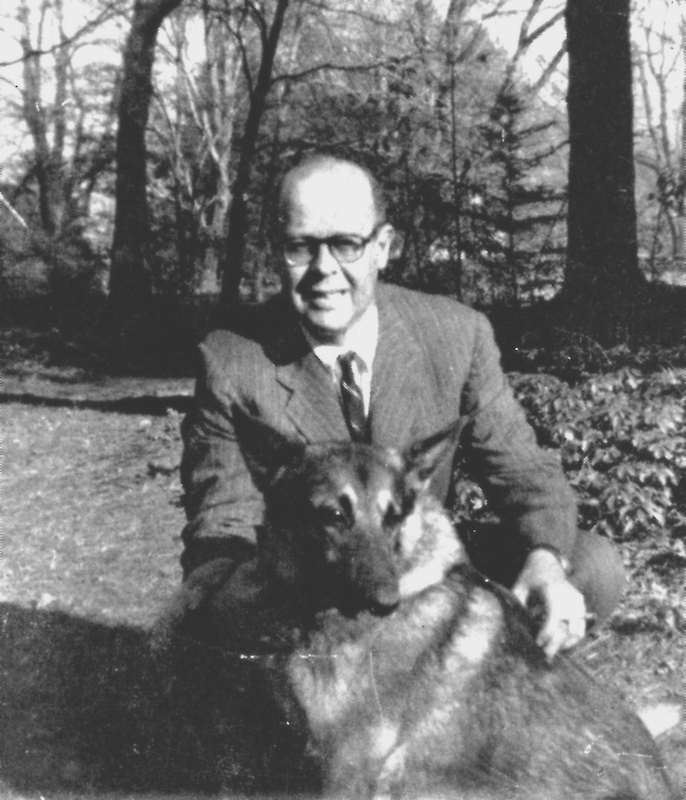 The family moved east when his father, a graduate of UC Berkley, completed a Ph.D and taught at Yale. As a result, Ham, Jr was educated at some of the finest schools in the US. According to his semi-autobiographical Fish Flying Through Air (1957) he joined the Royal Canadian Air Force long before the US entered WW2, and ended up serving as a lowly Sergeant Armourer in the RAF. Whether this was truly the youthful jump at adventure the book describes or a more deliberate rebellion against his father is debatable. It could even have been both. What is clear is that Roswell transferred to the US Army Air Corps on October 13th, 1942 – as a Corporal – once the US lifted its prohibitions against Americans fighting for foreign (i.e. Allied) governments. After the war, he married Westport, CT divorcée Barlow Cutler and the couple had two daughters. However it doesn’t seem to have worked out. They remained married, officially at least, as Roswell’s writing career blossomed, but something – that spirit of rebellion, war memories, or pure writer’s hedonism – carried him into chronic alcoholism. In May 1958 he faced court in Bridgeport, CT on six charges of arson affecting his father-in-law’s house. Despite acquitting him on four of the charges, the judge committed him Ham, Jr for psychiatric observation and described him, somewhat prophetically, as ‘a derelict, afloat on a sea of liquor’. A little over a decade later, on March 7th, 1967, a derelict Roswell G Ham, Jr was pronounced dead at the charitable St. Vincent’s Hospital in New York. He was 47 years old. Regardless of how Roswell Ham, Jr saw things, his father was proud of him and kept a file of newspaper clippings about his adventurous, talented son. I’ve found a copy of Fish Flying Through Air (later re-released as Til The Rafters Ring) and it is eloquent, erudite, hilarious and bursting with a breakneck joie de vivre. If you’re looking for insights into the bright spirit of ‘The Greatest Generation’, it’s a good place to start. An excellent story about the perspective of the ground crew. Thank you for posting it. Jim Pettus touched on the hard work of the ground crews in his preface for our book on the 43rd Bomb Group. Here’s the excerpt: “…It was like no Boy Scout campout and the most dismal part was that there was no prospect that it would improve or soon be over. So what did they do about it? For the most part they pitched in, made camps with great ingenuity and the ground crews worked their sunburned hearts out on the aircraft that left their hardstands to do battle with the Japanese. Every ground crewman knew that the lives of ten men depended upon the work that he did, no matter how insignificant it might seem. Any little item neglected might cause a loss; losses would surely come, but by the environment and enemy action, not neglect. It was heartbreaking to see the ground crews standing by waiting for THEIR plane, especially if the machine was known to be missing. On returning from a mission, when a plane taxied into its hardstand area, the first call always was, “How was she sir?” Not how tough was the mission or how was the bombing, but how was my baby? Or, if you came in all shot up it was, “What have you done to my airplane? 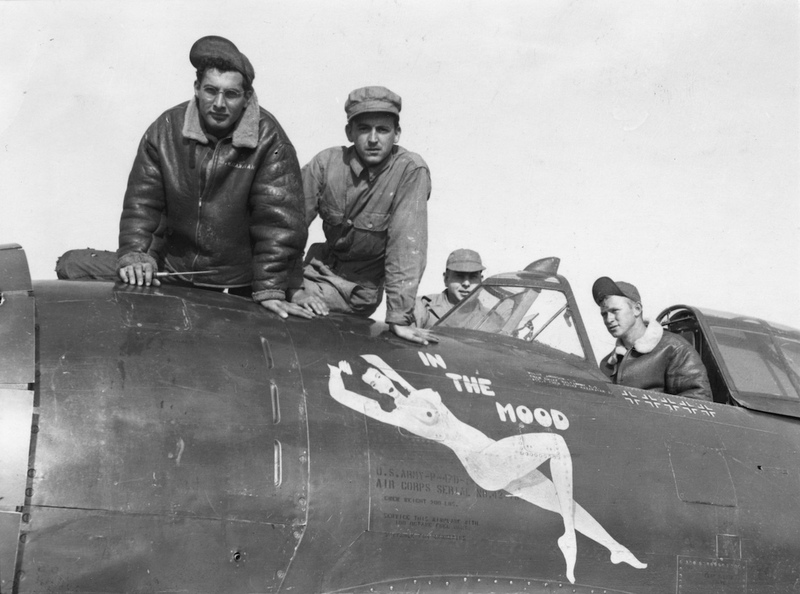 !” Crew chiefs regarded the aircraft as their personal property and in many ways, it was. Interesting how often it is appreciative aircrew who finally give their ground echelon the recognition they deserve. That’s why I was more than happy to include links to the Bud Anderson site – the crews feature heavily in his book and online content. But I know my post was a typically European/8thAF piece, so thank you for providing some balance from the ‘other war’ in the PTO. It’s great to see how much the aircrews appreciated the hard work of the ground crews. 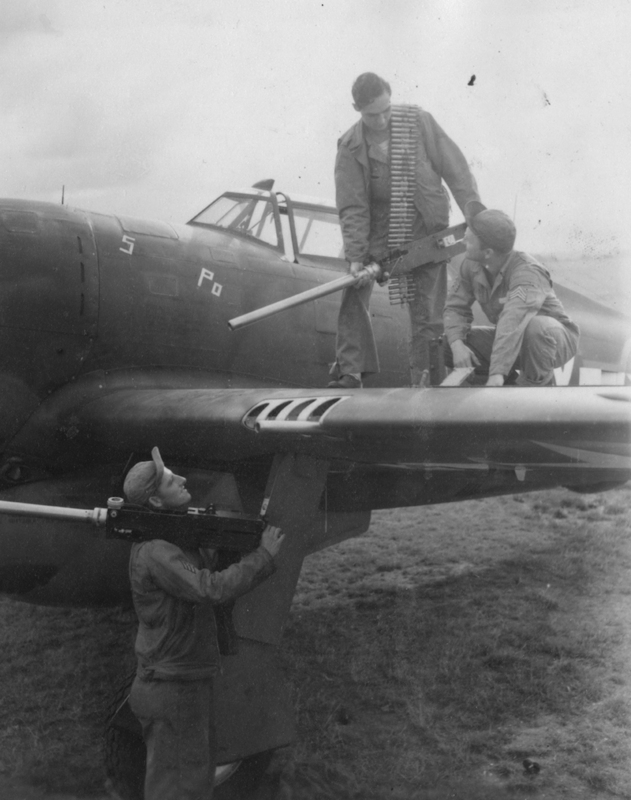 While the men in the air were given most of the attention, they knew they wouldn’t be there without the mechanics and others working to keep their planes in good shape. Ground crews really were unsung heroes and they deserve every bit of respect and recognition for what they did. Often the waiting is worse than the being there, and when your pride and joy doesn’t come home, it’s a loss that you must carry with you for many a year. Absolutely. It must have been a real stomach-punch… every time. People forget that while pilots served a combat tour and often rotated home, the ground crews stayed ‘for the duration’, working day or night, rain or worse. I’m sure a lot of crews lost more than one plane and pilot in that time, and never got used to it. Mind you, other crews worked, bonded and celebrated with their pilots for over a year only to have them snatched away without warning. George Preddy comes to mind. What must it have been like for his ground crew that Christmas Day in 1944?? A very good point! We often forget they stayed for the duration seeing pilots come and go, and some, like Preddy, in the most awful circumstances. A real heartbreaker. I really enjoyed reading this account! It is absoulty precious and totally tugged at my heartstrings.